If someone asked me if I liked the colour yellow I would probably say not really. Well, at least that's what I thought until I started looking around my house and realized how much yellow I have. My kitchen, family room and bedroom all have bits of yellow. Maybe because it's Spring, maybe it's the dreary Vancouver weather we've been having but I now want to kick up the yellow factor a bit. I found a couple photos of a den done by none other than Sarah Richardson a few years back. I always loved this room and realized my family room has some similarities with all the neutral furniture. I'm thinking yellow drapes. Too much? And while I'm on the yellow bandwagon, Flourish Design + style posted a great outfit shot today featuring yellow that I really want to wear. Cute heh! Happy Yellow...Enjoy! I adore yellow. That SR room was one of my favourites!!! Love the drapes, and also the light fixture. 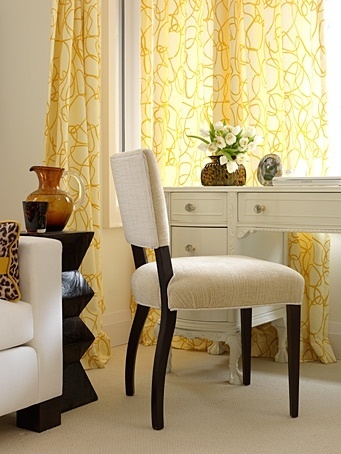 Yellow is such a happy colour, love the yellow curtains! I agree! Yellow is definitely a cheery colour!